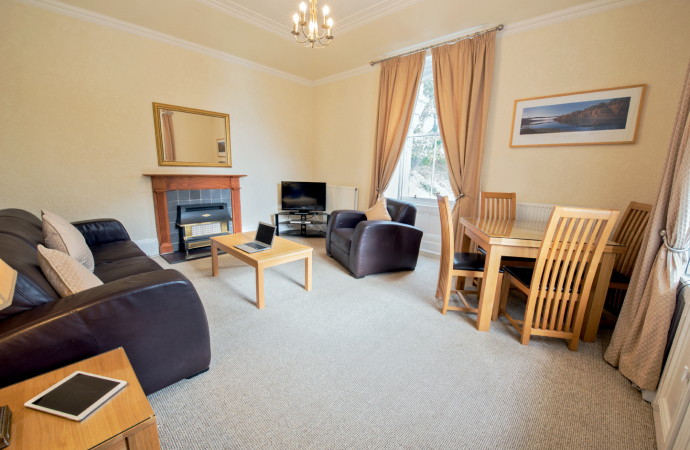 Pentland is a beautifully proportioned, two-bedroom, self-catering serviced apartment on the first floor of Northcliff House in North Queensferry, Fife, near Edinburgh. You will enjoy watching deer, squirrels and bird life from the comfort of the spacious lounge. 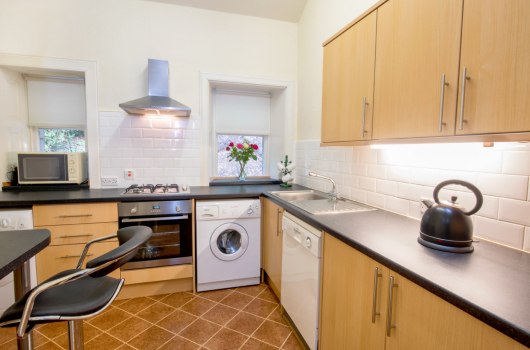 This self-catering serviced apartment is an ideal base for professionals working in the area, whether in Rosyth, Dunfermline, Edinburgh or the South Gyle business centres. And there is a small second bedroom for visiting family. 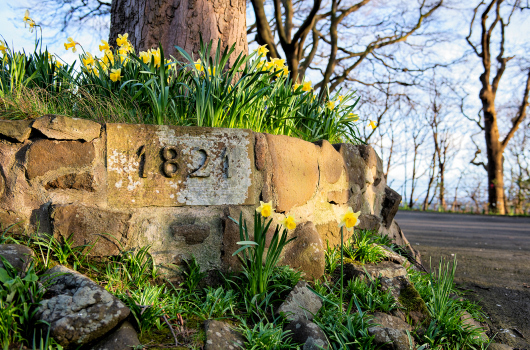 Spacious lounge with spectacular views over the River Forth and the Forth Rail Bridge, a UNESCO World Heritage Site. Dining area within lounge for relaxed meals while enjoying the views or as a home office to catch up with work. Well equipped kitchen with breakfast bar. 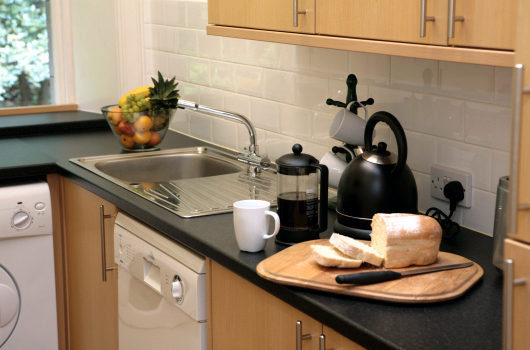 Equipment provided includes gas hob / electric oven, washing machine, dryer, dish washer, fridge / freezer, microwave and coffee machine. 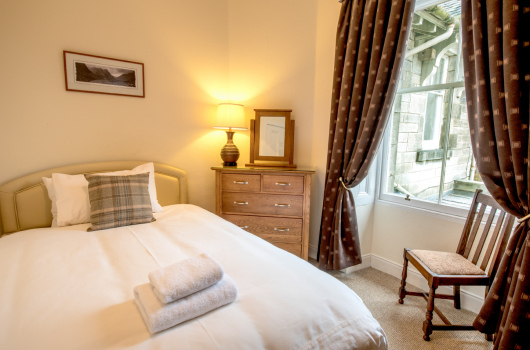 Bedroom one has a traditional fireplace and double bed. 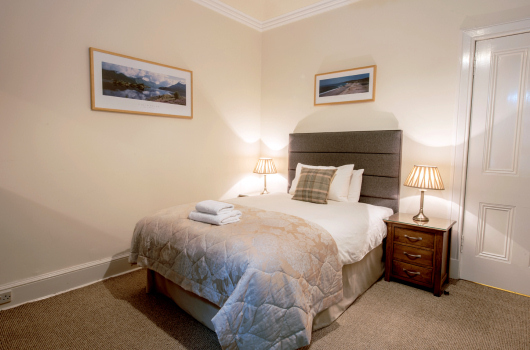 Bedroom two has a double bed suitable for one guest. Fully tiled bright bathroom with bath and shower over. Thank you for such a lovely stay! The apartment is beautiful and we could have stayed a good long while. Can't wait to come back! Lovely to revisit 28 years on. The view is superb as always. Thank you for making us so welcome!